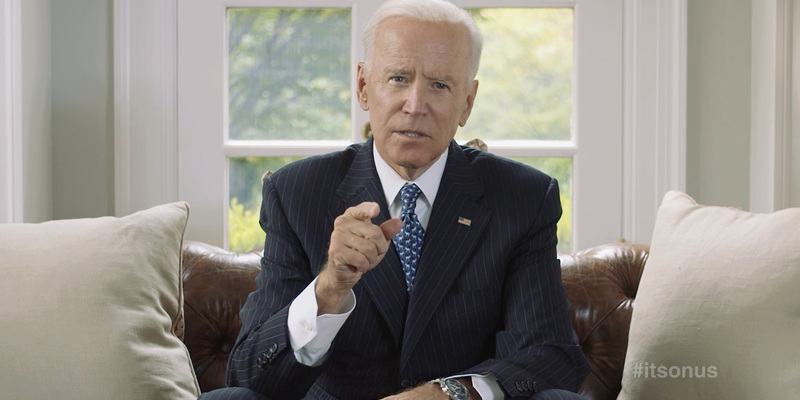 In the new “It’s On Us” PSA, former vice president Joe Biden delivers what may be his most emotional plea yet. “It’s On Us” began as a sexual assault awareness and prevention campaign under the White House in September 2014, working with creative agency Mekanism. Initial efforts featured President Obama, actor Jon Hamm and Biden himself, and further spots went on to feature First Lady Michelle Obama, Questlove and many others. The campaign now continues under Civic Nation, its most recent addition being the “Autocorrect” effort in March. Earlier this month, Education Secretary Betsy DeVos said the Department of Education is in the process of “rescinding the Obama administration guidelines” on Title IX policies regarding campus sexual assault, which has lent the effort a renewed sense of urgency. In a new PSA from Mekanism, Biden addresses DeVos’ remarks, stressing that the message that “It’s On Us” to address the issue of sexual assault on campus is truer than ever, given the stance of the Department of Education under its new secretary. The new PSA begins with a montage celebrating the accomplishments that “It’s On Us” has racked up over the past three years, including over 440,000 people taking the “It’s On Us” pledge and over 3,000 events held at more than 575 campuses, as well as “It’s On Us” legislation that was recently introduced in Pennsylvania. “Everyone has a role to play in preventing sexual assault,” Mekanism CEO and president Jason Harris said in a statement. In 2015, Harris and Wolf & Wilhelmine founder Heidi Hackemer co-founded the Creative Alliance, a collection of creatives and communications experts creating “campaigns that turn great ideas into action and engagement,” when both were working on separate projects with the Obama-Biden administration. Since its inception, the Creative Alliance, which is co-chaired by Harris and Broadway Video president Britta Von Schoelerhas, grown to over 70 members.